Yes they are back out in the forest again. 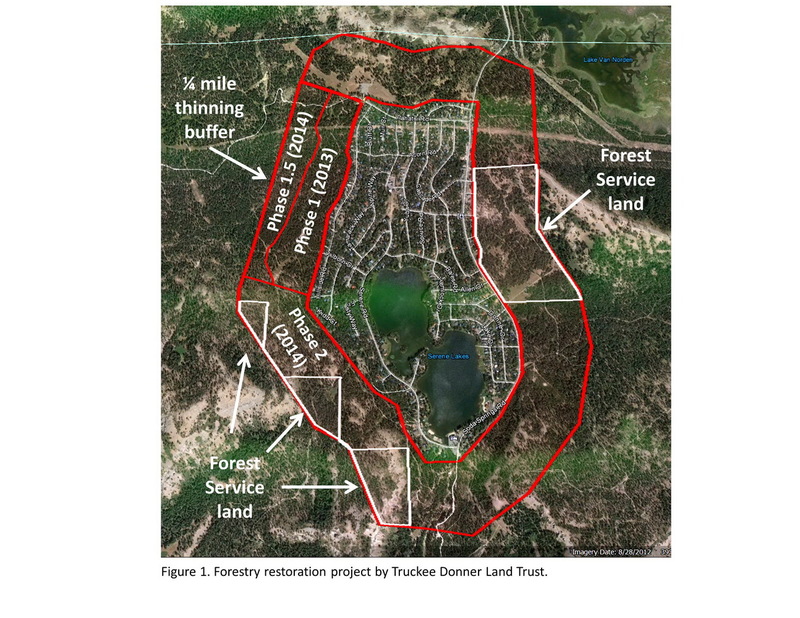 This week the forest restoration project being carried out by the Truckee Donner Land Trust has started up in the Royal Gorge area surrounding Serene Lakes. The map in Figure 1 shows the planned area for restoration this summer. This year there will be changes in the forestry techniques being used to thin the overgrown forest. Last year older equipment was used that resulted in higher impact on the forest floor. A tracked Feller-buncher was used to cut the trees and then a separate delimber was used to delimb the trees. A separate tracked grabber was used to gather the logs and skidders were used to transport the logs to the landing zones. Finally tracked masticators ground up the brush. All of this tracked equipment had significant effects on the forest floor. This summer there will be a whole new type of low impact forestry equipment treating the forest. Rather than tracked equipment which tears up the forest floor, the equipment this year moves around on sets of large rubber tires. The primary tool is the Tree Harvester which unlike the Feller-buncher, has a fully articulated arm that has a grabber-cutting head that cuts trees at ground level and also rollers that manipulate the tree trunk to delimb it. Instead of using skidders to transport the fallen tree by dragging them across the forest floor, a piece of equipment called a Forwarder uses an articulated grabber arm to load the logs into a carrier bed and transport them to the landing zones. You can see these two peices of equipment in action in the video below. Just be careful if you are out in the Royal Gorge area west of Serene Lakes this summer. The forestry work will be going on for the rest of the summer and so keep an eye out for this heavy equipment.